I admit, I’m not a meal-prep-for-the-entire-week-on-Sunday type of person. But, I do like to cook a few dinners ahead of time when I can. This week I mixed up my meal prep by making these simple, versatile, frittatas to help up my breakfast game. Some mornings I have time for a quick breakfast, and the other days lunchboxes are zipped into backpacks as we’re walking out the door. These frittatas add satisfying protein and a few extra veggies into my morning to help keep me full until lunch. One of my favorite parts about this recipe is the endless number of flavor combinations! Fresh herbs that complement your vegetable flavors – chives, basil, parsley, cilantro, etc. 3. Whisk together the eggs, milk, cheese, salt and pepper in a large bowl. 4. Divide vegetables and herbs equally among the muffin tins and pour in the egg mixture. Do not fill all the way to the top as the frittatas will rise during cooking. 5. Bake for 25 minutes or until set. Let cool for a few minutes in the pan and then remove to a wire rack. The frittatas will keep up to three days in the fridge and can also be frozen up to 1 month. To reheat, wrap in a paper towel and microwave for 30-60 seconds. To make a vegan version use a non-dairy milk and omit the cheese. Hello again! I’ve spent some time away from this space in an all-consuming real life, but I am excited to start writing again! You can also find some shorter content and recipes on Instagram- check out @milestone_nutrition! Peaches are one of the highlights of summer and peaches freshly picked from the tree (by your own two hands!) are a special treat. 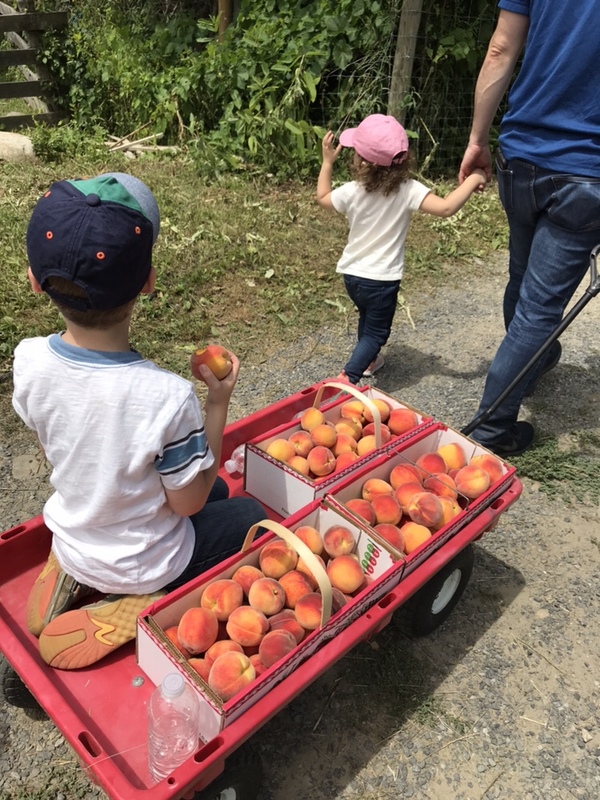 We went to Dubois Farm a little early this year and picked some of their delicious peaches. While slightly hard when just picked, a day on the counter worked wonders to create ultra juicy, sweet fruit. Peaches are packed with vitamin A to help keep your eyesight sharp and vitamin C to act as an antioxidant, keep your immune system strong, repair tissue damage and help absorb iron, especially from plant based sources. 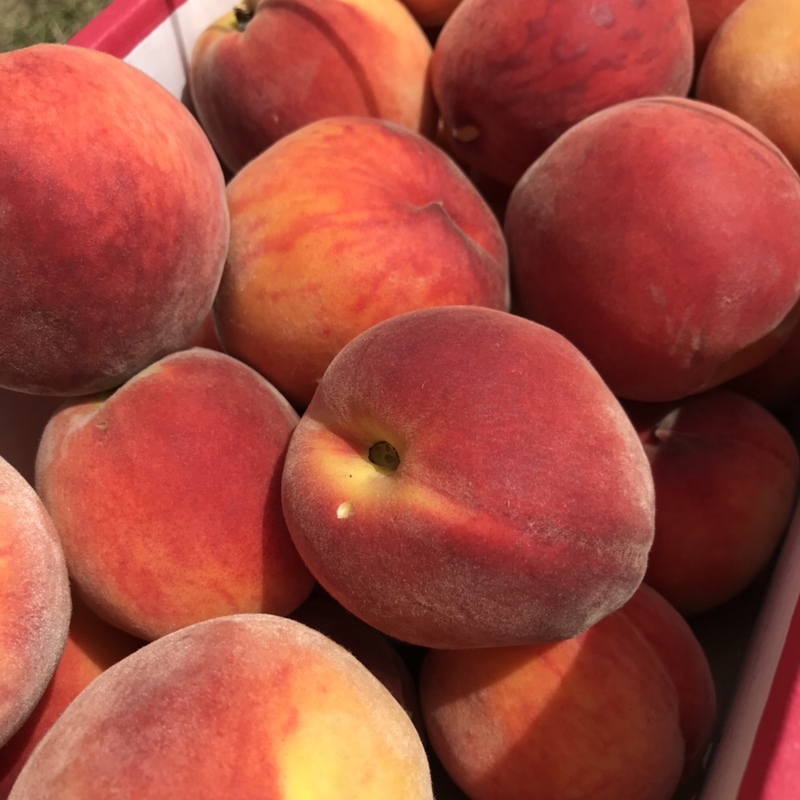 Peaches are also packed with fiber to help keep your gut bacteria healthy, which in turn, also helps keep your immune system functioning at its peak. You don’t want a cold to knock you out of these gorgeous summer days or worse yet, a vacation. Peaches can be stored on the counter for a few days, but if not eaten right away I recommend refrigerating them. They are perfect by themselves and as a snack in the park. My kids ate more peaches in two days than I can count. It’s true that involving kids in the kitchen and/ or in meal prep (or in this case, gathering) is a great way to get them to try new foods. This pasta recipe* has been on my list for a while, and I have to admit, I expected a bit more. But, instead of writing it off, I’m writing about how to make it better. It was quick enough for a weeknight, which is always a plus, and the roasted cauliflower can be made the day before. I followed the recipe exactly and I think the key ingredient is the lemon juice or lemon zest at the end- it really brightened the flavors. A little more salt, more peppery arugula and olive oil would also help give it depth. It would be good with fresh ricotta and (more) lemon zest or as the base for a flaky white fish. This dish can easily be made with chickpea pasta to add protein, reduce carbs and add extra fiber. Did you buy the wrong herb? Do you have most of a big bunch left over from a recipe? 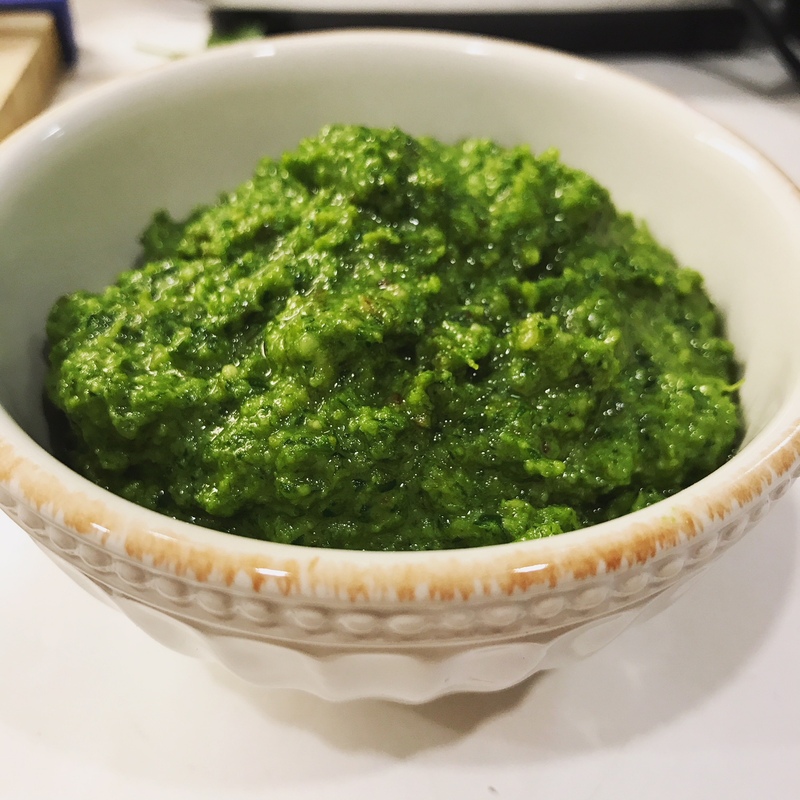 Don’t worry, there’s a pesto for that. This recipe from Simply Recipes is a good, cold weather pesto – heavy enough to have on steak (or steak sandwiches) and light enough to pair with roasted vegetables or with veggies and pasta. All in all it’s a good way to get in your greens from the herbs and healthy fats from the walnuts. I don’t know why it took me six years to make this chickpea salad, but now that I did, I’m certainly not going to wait six years to make it again! This delicious blend of chickpeas, herbs, salty cheese and tangy lemon juice make for an addictive and versatile dish. Chickpeas provide filling protein, fiber and complex carbohydrates as well as potassium and folate. The ease of preparation makes this a quick side dish or a last minute afternoon snack to take to work or on a road trip. It will keep for a few days in the refrigerator if you don’t eat it all the same day!